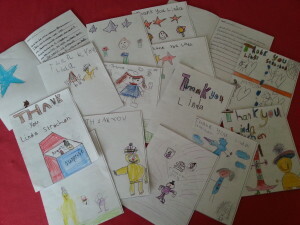 I write books for all ages, for young children to teenage and adults. I have also written a book on writing - Writing for Children - for both aspiring and newly published authors. While I spend quite a lot of time visiting libraries, schools and festivals talking about my books and running creative writing workshops, I do manage to find time to write, too! You can download the free story: Hamish McHaggis and the Aberlady Gala Mystery. I’ll be at the lovely Mitchell library in Glasgow on Monday 20th April 2-4pm for an event on writing for children. Children’s author Linda Strachan gives an expert insight into writing for children. 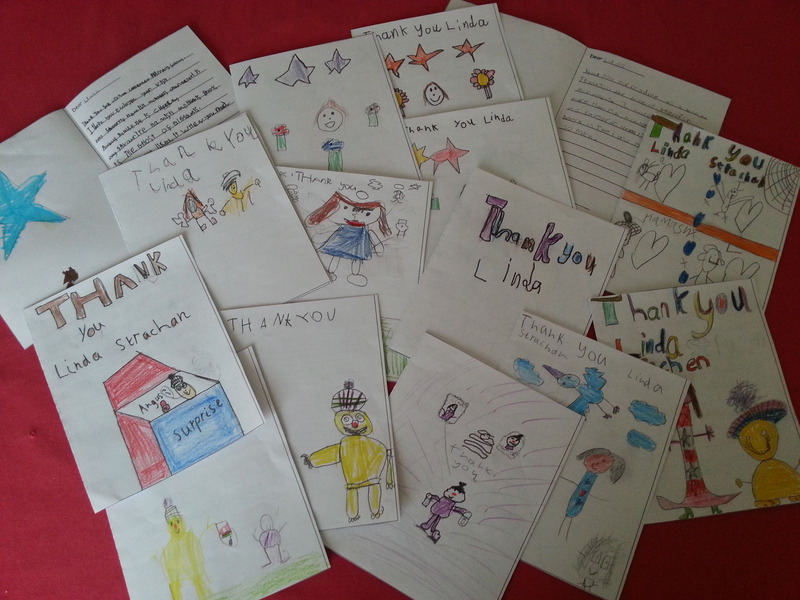 I had a lovely time at Cardenden Primary School in January and these arrived in the post this week! 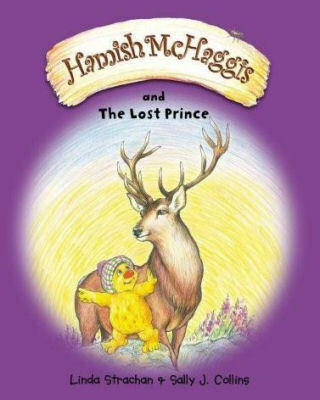 Lots of great Hamish McHaggis work going on there! 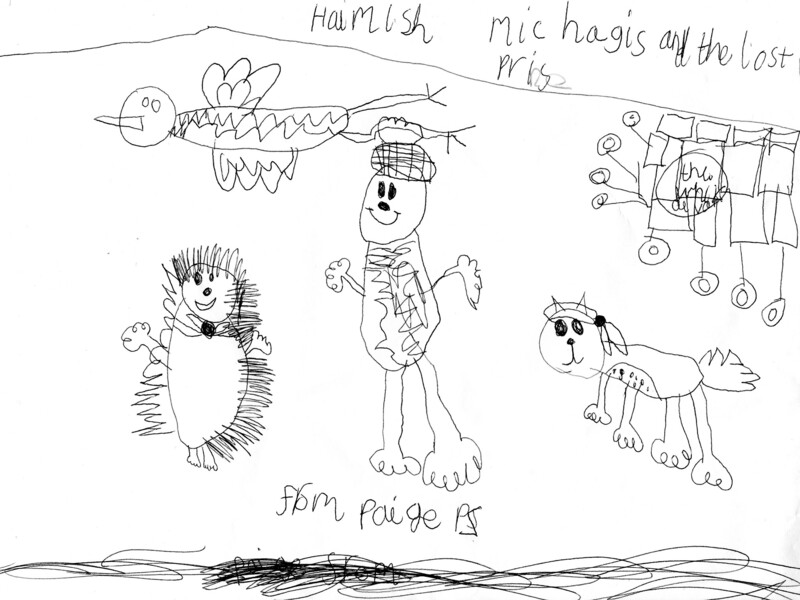 I had a lovely time last week when I was up in Aberdeenshire for Book Week Scotland. I visited Strachan Primary (had to remember to call it STRAWN!) and spoke to both composite classes there. The little ones (Mainly P2) were all very keen on Hamish McHaggis! 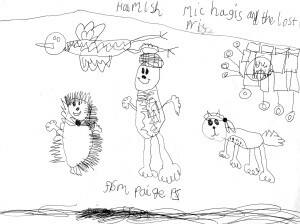 I spoke to the older class P4-7 about Greyfriars Bobby and of course Hamish got a wee look in, too! 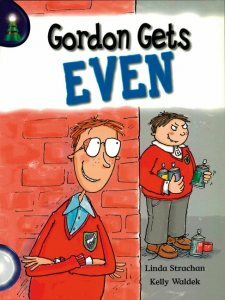 I read Gordon Gets Even which they enjoyed and led to a bit of a chat about bullying. Later that morning I spoke to a class from Mearns Academy, S2, about Spider and my other YA novels. Lots of interesting questions but sadly, as often happens we ran out of time! Many thanks to the lovely librarians and teachers who helped organise these events and the Jules and Forbes for your kind hospitality in Strachan. Always a pleasure to visit Aberdeenshire, and I’m planning another wee tour in the area, a bit further north, in March 2015.